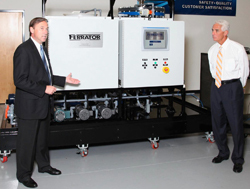 23 September 2010 – Florida Governor Charlie Crist met this week with Ferrate Treatment Technologies’ CEO and Founder Luke Daly and toured the GTE manufacturing facility where Ferrators are assembled. Ferrate Treatment Technologies (FTT) holds a worldwide technology portfolio for the most powerful, multi-use, environmentally friendly water treatment technology known. This naturally green chemistry is based on a low-cost, supercharged iron molecule known as Ferrate or Iron (VI). Ferrate’s chemistry has been understood for decades but prior manufacturing methods were too expensive for broad industrial use. For the first time, FTT has unlocked Ferrate’s vast commercial potential by patenting an on-site synthesis method that reduced production steps from 23 to 5 – reducing traditional Ferrate deployment costs by over 90%. FTT was just named to the new class of Technology Pioneers by the World Economic Forum joining 30 of the most innovative technology start-up companies from around the world. These companies represent the cutting edge in innovation and are poised to have a critical impact on the future of business, industry and society. The Wall Street Journal awarded FTT the Best and Brightest Environmental Technology Innovation award. Forbes magazine designated FTT One of America’s Most Promising Companies in 2009. Ferrate Treatment Technologies, LLC was founded to invent, develop, and commercialize innovative advanced water and wastewater treatment technologies based on its proprietary iron chemistry platform. FTT has U.S. and international patents for a synthesis process and reactor system to manufacture Ferrate on site.